The Choral Arts Society of Washington will host the 33rd Annual Holiday Gala, Monday, December 16, 2013 at the John F. Kennedy Center for the Performing Arts. The fundraising event will be donating all proceeds to Choral Arts’ artistic programming and community initiatives. Last year’s event raised $625,000. 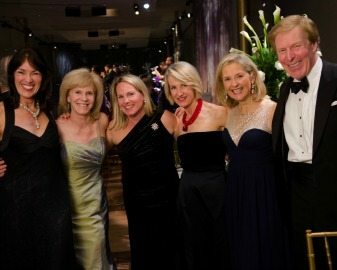 For the last 20 years, the Gala has raised more than $6 million. The Enchanted Christmas holiday concert will be followed by a black-tie reception, dinner and dancing on the Roof Terrace Level, as well as the event’s annual silent auction. Referred to as “the best silent auction in D.C.,” added to the program in 1993. Olwen Thorpe Pongrace, Choral Arts Board Member, is the Chair of this year’s gala. This year, the event is celebrating the Year of Italian Culture in the U.S. As a result, the Ambassador of Italy and Mrs. Bisogniero agreed to serve as Honorary Patrons. The Choral Arts Society was honored in early July with being included in the 2013-2014 Catalogue of Philanthropy: Greater Washington. The Catalogue’s mission is to connect citizens with worthy community causes and recognizes nonprofits in the culture, nature, education and human sector services. “It is invaluable to receive a seal of approval from such a respected organization: the recognition communicates to the community that supporting Choral Arts is a worthwhile investment,” said Debra Kraft, executive director of the Choral Arts Society. Known for her commitment and dedication to the arts, Cathy Jones is a long-time member of the Choral Arts and serves as veteran Finance Committee Chair. She has been in that role since 2009. WashingtonExec spoke with Jones last December, and we asked her about her involvement with the organization. To read our interview with Jones, click here.